In a world where volatility is the new norm and change is a constant, the individuals and organisations that are flourishing are those with a clear sense of purpose based on authentic ethical values. Purpose is the secret ingredient - with purpose you have the key to exceptional performance, greater wellbeing and clarity in a VUCA world. But how do you find such purpose and ensure it propels your business forward? The Power of Purpose shares a simple 6-step framework you too can identify, clarify and shape your business purpose. You’ll gain a competitive advantage and boost your bottom line, but the benefits are not just commercial – you’ll also inspire a new generation of employees, foster innovation, simplify decisions and build customer and brand loyalty. 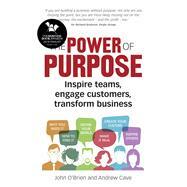 Based on qualitative interviews with well-established and emerging leaders on how they bring ethical purpose in business to life, as well as sharing the results from a questionnaire with purpose-led businesses you’ll find a step-by-step approach for applying purpose to simplify complexity, harness a purpose-powered workforce and create customer loyalty. How can purpose provide clarity? How can it accelerate success? How can it build a long term sustainable business? The Power of Purpose is your secret ingredient. Andrew Cave is a renowned business journalist and author of 25 years’ experience. He has written for the Daily Telegraph since 1996, for three years as the New York based US Business Correspondent, five years as Associate City Editor and four years writing the City Life column. Andrew currently writes the weekly business profile in the Sunday Telegraph and regular columns for Forbes, CityAM and CorpComms Magazine. He also writes obituaries of business leaders for The Times. Andrew is the co-author of The Secrets of CEOs, based on interviews with 200 global chief executives. Andrew joined Destria Partners in 2016 as lead on business media advisory activities.